Last weekend I attended Gen Con for the first time and it was amazing. I’ll probably have to write a couple posts to capture all of my thoughts on the trip, so this one is going to focus on games I looked at, learned about, played, or bought at the con. Most of the scheduled events that my brother and I attended were related to D&D Next. In addition to the keynote, we attended a few panel discussions about D&D Next and played in a playtest adventure. The keynote had the most news with the announcement that digital versions of previous edition products would be released next year and that Forgotten Realms would be the first setting that gets attention for D&D Next. The various D&D seminars really just went deeper into some of the topics mentioned in the keynote: core mechanics, monsters and magic items, the story direction for the Forgotten Realms, and artwork. I’ve previously posted some thoughts on the first D&D Next playtest packet (here and here). The second playtest packet and the seminars have generally reinforced that I like a lot of the ideas going into D&D Next even if I still have a few reservations. I like the move from encounter balance to adventure balance and that the class mechanics are diverging rather than all following the same pattern like they did in 4e. One thing from the seminar that I was particularly happy to hear was that there would be a high level playtest of the game before release which should help avoid some of the system breakdown that D&D has historically suffered from at high levels. Our playtest wasn’t the best, but that was mostly due to having 8 players rather than any fault of the rules. I created a halfling rogue for the playtest and was pretty happy with the character creation rules. My favorite aspect was the Thug background benefit that allowed for him to get away with minor crimes even though it didn’t get used in the delve at all. The adventure had us fight a couple of groups of zombies then confront an undead drow warrior. That final climactic fight went very quickly when one of the party’s clerics got a critical hit with his searing light power to vaporize the drow. Having that many players really took the focus off of any individual character and meant most fights went quickly since we outnumbered our enemies about 2:1 in most of the encounters. I’ve never been a big Forgotten Realms fan, but despite that I really enjoyed listening to the author panel about the Sundering. The event is intended to advance the Realms timeline in order to return it to a form closer to the original Realms while also moving the major NPCs into the background in order to allow player characters to shine after the Sundering has finished. I got a chance to watch part of a demo of the new Star Wars RPG, Edge of the Empire. It looks like it has some interesting mechanics and is taking a nod from some more player driven systems like Fate. After Edge of the Empire, Fantasy Flight is planning at least two more Star Wars RPGs: Age of Rebellion and Force & Destiny. I’m disappointed that the beta release costs $30, but will be keeping an eye on the game’s progress to see if I’m interested in buying it when it’s released. In the mean time I have my Saga Edition books and NewbieDM’s Age of Rebellion hack for the AGE System if I feel like gaming in the Star Wars universe. This game wasn’t even on my list of games to look at during the con, but during my final walk through the vendor hall on Sunday I decided to buy a copy of the paperback pocket edition when I stopped by the Green Ronin booth. 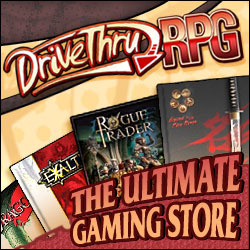 The $25 price point is pretty good for a physical copy of a RPG and the game looks like a pretty good match for the gritty gameplay that I’ve been craving lately. After reading a bit of the book on my plane trip home, I especially like the way that the game includes the noble house as a core mechanic. The players collectively create their house as the first step in party creation including its history, heraldry, and statistics that represent it in gameplay. I could easily see borrowing that subsystem for other game systems. Before Gen Con, I had heard good things about this upcoming RPG, so I wanted to take a closer look during the con. The Pelgrane Press booth had a printed version of the current playtest version that I flipped through, and I talked to one of the booth staff a bit about the game. The game is based on the d20 system with a lot of interesting ideas added in such as including relationships with the settings 13 powerful Icons, an escalation die that makes combat more deadly each round, and an open-ended skill system. There is currently a Kickstarter for the game’s first expansion as well as a pre-order for the game itself. My brother and I are both huge fans of Super Dungeon Explore, so the first thing we did in the vendor hall was buy copies of the Caverns of Roxor expansion. The box comes with 3 new heroes, 3 spawning points worth of enemies, and a few new treasure cards. The new heroes are the Star Guild Sapper, the Deeproot Scout, and Princess Ruby. The Sapper is a hard-hitting dwarf who can ignore most status effects. The Scout is a Link-inspired character armed with a sword, a bow, and a treasure chest retrieving boomerang. The Princess is focused on supporting other characters with the ability to heal, boost strength, and boost will. One nice change from the original game is that the miniatures come mostly pre-assembled. Soda Pop also had a preview of the next SDE expansion that is going to be focused on horror monsters with skeletons, vampires, and werewolves. 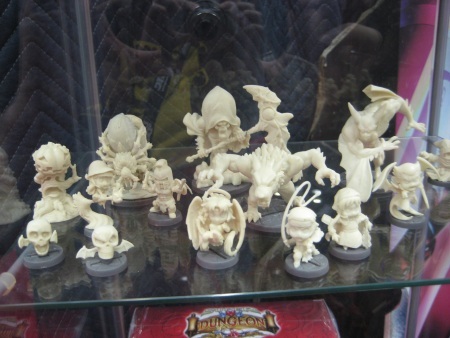 The minis for that set looked fantastic, and it looks like it will include both new monsters and new heroes just like Caverns of Roxor. While we were at the Soda Pop booth, we also checked out their upcoming Relic Knights game. It is an anime-inspired skirmish game that uses a deck of resource cards and doesn’t use dice. The miniatures look fantastic and the game seemed to have some really neat mechanics. One of the mechanics I liked was the initiative system where you designate a ready queue of characters who will act next since it requires you to think ahead about which units you want to move on upcoming turns. Soda Pop is currently doing a Kickstarter for Relic Knights. My first exposure to Tsuro was when it was featured on one of Geek & Sundry’s TableTop episodes. It looked like a lot of fun on the show, so when I saw it at one of the booths at Gen Con, I decided to buy a copy. My brother and I played a few times when we had a half hour or so to kill at the con, and had a lot of fun with it. One of the highlights of Gen Con for me was playing Cards Against Humanity with a few other bloggers on Saturday. I think we were laughing pretty much non-stop for about 3 hours. If you like Apples to Apples, then I strongly recommend trying it out. I don’t have my own copy yet, but I plan to order one once its back in stock on Amazon. I had been hoping to get copies of Android: Netrunner and Iron Kingdoms at Gen Con, but Netrunner had sold out very quickly and I found out Iron Kingdoms isn’t actually out until next month. Both games are still on my list of things to buy once they’re available. While we tried to get into a demo of Dungeon Command and failed, what I saw of the game wasn’t enough to convince me to make a purchase. I do think I’d like a copy of Leviathans after watching a bit of a demo game, but the size of the box meant it wasn’t going to be a Gen Con purchase since it wouldn’t fit in my suitcases for the return flight. Congratulations on your first time attending Gen Con. I find D&D next fascinating, until now I’ve checked out each update to see what has changed. Not to go in too much detail, but I like the spells, the diverging mechanics for each class, faster combat, the themes and backgrounds. I still have some reservations about class balance and the license D&D next will have, we’ll have to wait and see.